Thyme (Thymus vulgaris) is a low-growing, woody perennial. It is a highly aromatic Mediterranean herb that performs especially well in somewhat dry, sunny conditions. It holds its flavor in cooking and blends well with other flavors of its native region, such as garlic, olive oil, and tomatoes. Thyme is considered to have antiseptic and preservative properties and has long been used medicinally as well as to preserve meats. You’ll even find thyme in perfume. The tiny pink, lavender, or white tubular flowers of thyme plants show up in the spring and summer and are well liked by bees. The tiny gray-green leaves remain evergreen, and most varieties can even be harvested in winter in the zones where it is a perennial. 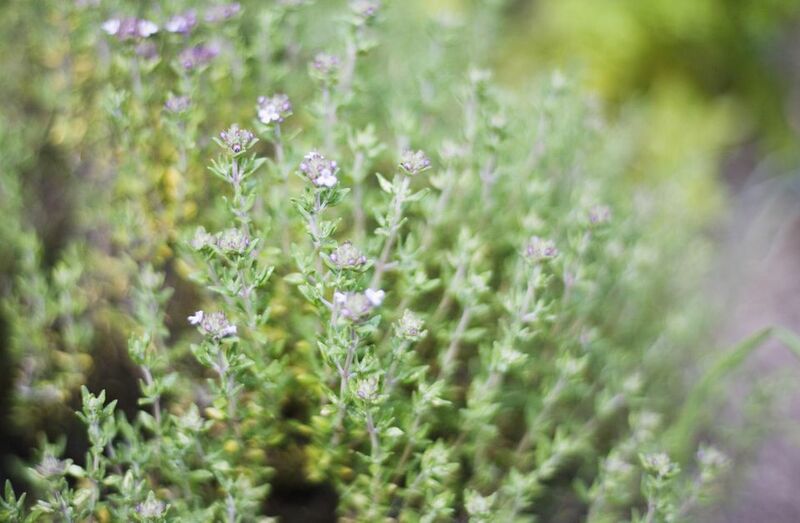 There are about 350 different species of thyme, in many scents and flavors. Thyme is widely adaptable, growing in United States Department of Agriculture Hardiness Zones 5 through 9 or even higher, though in zone 10 it may die off in the heat and so is planted an annual there. Different varieties of thyme have different growing habits. Some send up flower stalks, others form mats, and still others will cascade. Some varieties form an almost flat carpet. In general, though, thyme is generally low growing, spreading, and 6 to 10 inches in height. Most varieties of thyme are best left alone to grow; the more you fuss with the plant, the less hardy it will be. Give your thyme a spot in full sun; it handles hot, dry conditions better than cool, damp soil. Ideal soil is well draining and about 7.0 pH or slightly alkaline. Propagate plants by division or cuttings. The herb may be grown from seed, but the different varieties cross-pollinate and hybridize, so it may not grow true from seed. If trying to cover a large area, space new plants about 6 inches apart to form a cover. Established thyme plants can be harvested at any time because the leaves' flavor is retained even after flowering. Simply snip a few stems. Thyme is often used as a ground cover and is able to grow in the cracks between pavers and rocks. You can also buy seed in bulk to create a thyme lawn. Trailing varieties look nice in pots, especially the golden and variegated varieties. Thyme can be used as an edger but has a tendency to die out in spots, so be prepared to fill in with new plants. Golden lemon thyme (Thymus x citriodorus "Aureus"): This thyme has a true lemon scent as well as the minty quality of thyme and golden, variegated leaves. Woolly thyme (Thymus pseudolanuginosus): Very soft, flat spreading carpet (zones 5–6). It has no scent, so it's not used for cooking. It cascades nicely in rock gardens and can grow in patio cracks. Caraway thyme (Thymus herba-barona): This plant is low growing with pale pink flowers and the scent of caraway. Creeping thyme (Thymus praecox): True to its name, this variety grows as a low mat, only 2 to 3 inches tall, with pink, magenta, lavender, or white flowers. It's often used as a ground cover. Also look for thymes with the scents of orange, rose, and lavender, which can make delicious additions to soups, herbed butters, and tea. Your local garden center can make suggestions as to what varieties will thrive in your area. When grown in warmer climates where it can get shrubby, prune hard, in early spring, to prevent the plant from getting too woody. Additional shaping can be done after flowering. Otherwise, all that is needed is to prune by harvesting and to remove and replace any areas that die out. Ants like to build their nests in thyme beds and can disrupt the roots. Also watch out for spider mites in dry weather. If grown in damp or humid conditions, molds and rots can become a problem. Care should be taken that thyme plants are not sitting in wet areas throughout the winter months. Cover it in the winter to protect it from damage after the soil freezes.